On a tour last fall of the 3-D X-Ray Microscope Facility, graduate students (left) Reza Moini and Chven Mitchell, along with Laura Pyrak-Nolte, professor of physics and astronomy, explain the capabilities of the Xradia microscope to Jeff Bolin (right), associate vice president for research centers, cores, and research development services; Christopher Gilpin, director of the Life Sciences Microscopy Facility; and John Finley, professor of physics and astronomy. Photo by Angie Roberts. Last summer, the Office of the Executive Vice President for Research and Partnerships (EVPRP) announced that it was acquiring major multi-user scientific instruments to accelerate research projects across the West Lafayette campus. The purchases, made possible by support from the Office of the President and approved for funding in the 2017 spring semester, included a 3-D X-ray microscope for materials, life sciences and electronic research. Laura Pyrak-Nolte, professor of physics and astronomy, acquired and directs the microscope system, housed in the lower level of the Physics Building. In the following Q&A, she outlines its features and benefits. 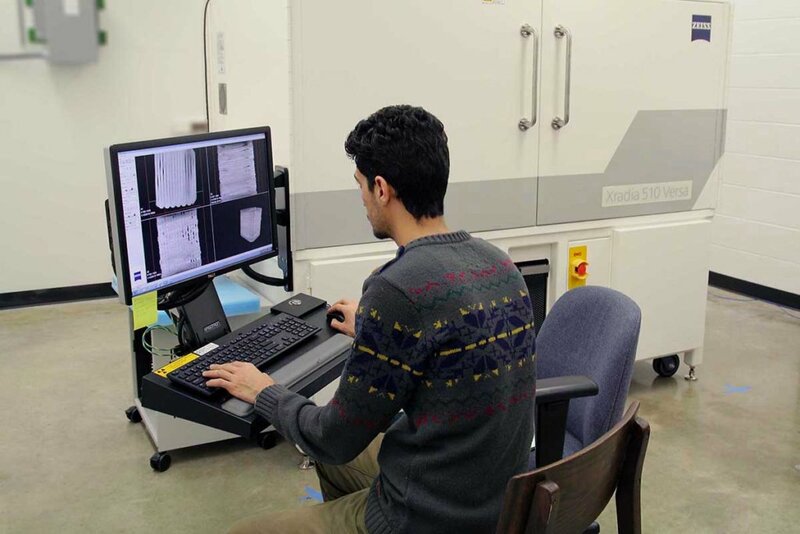 Graduate student Reza Moini reviews real-time visualizations of a sample being analyzed in the Xradia microscope. Photo by Angie Roberts. What brand of 3-D microscope did you acquire? The instrument is called the Zeiss Xradia 510 Versa High-Resolution 3-D X-ray Tomography Microscope System. It uses a scintillator to convert X-rays to visible light, which is then optically magnified. The Xradia 510 is considered the industry leader in 3-D and 4-D imaging capabilities for a wide range of samples and research environments. How will this microscope enhance sample analysis? By reducing the dependence upon geometric magnification, the Xradia 510 Versa is able to maintain submicron resolution at large working distances, which enables a minimum achievable voxel size of 70 nanometers with 0.7 micrometer of true spatial resolution on samples sizes up to 0.3 meters. Non-destructive multi-length-scale capabilities enable imaging of the same sample across a wide range of magnifications, making it possible to uniquely characterize the evolution of material microstructure between sequential treatments (4-D), or as they are subjected to simulated environmental conditions (in situ). What kinds of applications can this instrumentation be used for? high-definition characterization of developmental biology, for virtual histology, and mapping of biological neural networks and vasculature. More information on the Xradia’s capabilities can be found on the manufacturer’s website. A composite image showing 3-D samples of rat tissue, fine cracks formed from 3-point bending tests and compressed gas bubbles encapsulated in sugar. Rat Intestine is roughly 2 mm wide by 2 mm in length. The notch in the samples is 5 mm wide. The largest bubble (in yellow in the color image) is 200 micrometers = 0.2 mm. Images provided by Laura Pyrak-Nolte. How is this instrumentation unique and essential for research at Purdue? 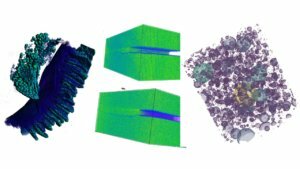 Until now, researchers at Purdue were unable to visualize the evolution of internal heterogeneity and structural complexity of opaque 3-D materials affecting macroscopic physical properties, processes and performance of natural and engineered materials. We did not have any system with 70 nm resolution for sample sizes up to 300 mm without destructive sampling that could be used on biological, rock and engineered material samples ranging in size from sub-millimeters to tens of centimeters. These limitations were creating roadblocks on the path to discovery. What is the broader importance of the Xradia acquisition? 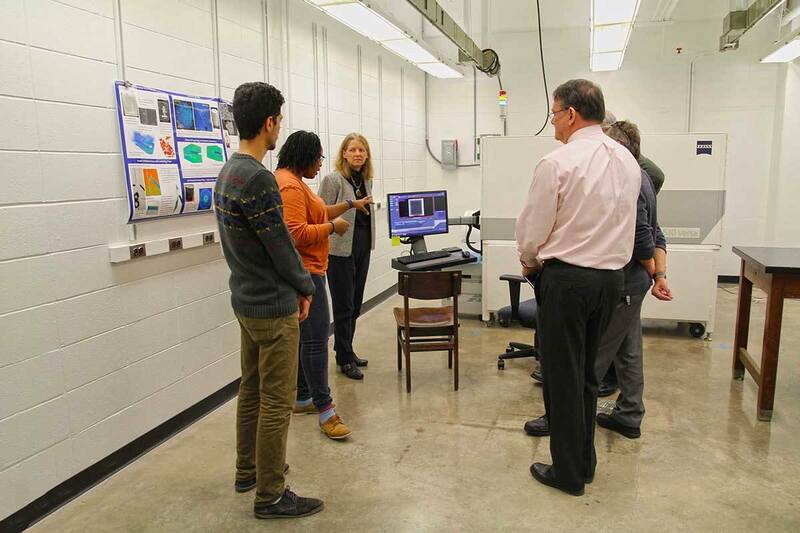 As the first 3-D X-ray microscope system at Purdue and in Indiana, the instrumentation will allow us to establish new capabilities here and around the state in the internal structures and properties of physical and biological objects and materials. The improved characterization capabilities will enable continued advancements in research and launch new opportunities with funding agencies and industry and will foster continued collaboration with Purdue-based laboratories and startups. The equipment also will be an important imaging system for many forefront emerging research areas and serve as an attractive recruiting tool for future faculty hires and graduate students across many disciplines as well. If I’m interested in having a sample analyzed at your facility, what should I do? Please contact me at ljpn@purdue.edu or 765-494-3005.